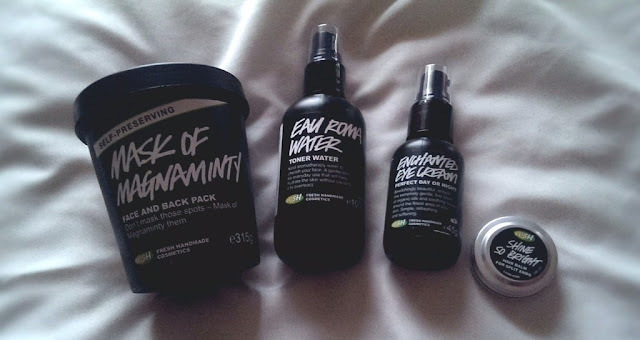 A brief round up of my favourite Lush products. None of my favourites include the famous bath bombs, purely because I rarely use them. However I am partial to the odd butterbear. My obvious choice as well as the limited edition one... Unfortunately this little beauty is only available during the festive period. Learning from my errors the year before, I made sure to stock up during the boxing day on-line sale. The sweet scent and glitter is what makes this a cheerful addition to my not so cheerful early morning showers. As the owner of sensitive skin, I can express that this is such a beautifully light, non irritant but hydrating moisturiser . It is perfect for a make-up base, or even for those no make-up days. Instant better skin in a pot. Never thought this could become such a cult product of mine. I'm not a particularly sweaty person, but after a bath I smooth this over my chest, between my thighs, and under my armpits. This makes my skin super soft , whilst displaying a soft seductive fragrance of jasmine and vetivert. I'm a big fan of rose water. I spritz this gem over a cotton pad and wipe over face to refresh. It's natural soothing properties make it a repurchaser time and time again. This encouraged me to use eye creams. It hydrates the eye area whilst and reduces the appearance of under eye bags. I'm also a fan of the packaging. A must for those who struggle hormonal skin problems. I use this no more than once a week to remove all the grime and pollution I get from my weekdays in the city. It makes my skin feel clean without the feeling of being stripped of all it's goodness.